How will this 'Raging Planet' affect you? Mars is a planet that brings high & volatile energy and just as in Vedic Astrology Sun is considered as the King of Planets, Mars is the Commander of the army of that King. Mars is the natural significator of bravery, courage and leadership. Plus the fact that Mars represents the Fire element, only justifies the fiery energy that it brings along in multiple aspects of one's life. Whenever Mars enters into a new sign as per its transitory movement, its effects are felt on different aspects of a person's life depending upon the presence of that particular sign in the natal chart of a person. 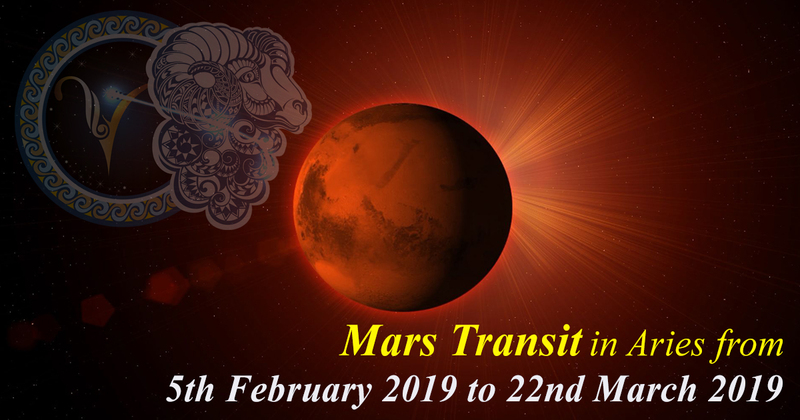 This time, on 5th February 2019 Mars will transit in the sign of Aries which interestingly is one of the own signs of Mars (the other one is Scorpio) and it will remain in Aries till 22nd March 2019. This period will signify different effects of this 'Planet of Wars & Conflicts' in the life of different people. Mars will transit in 1st house of your horoscope and will form "Ruchak Rajyog". Mars will make your personality impressive and every task of yours that was obstructed for some reason or the other since past will be accomplished with your hard work. Your name and fame in the society will increase during this time. 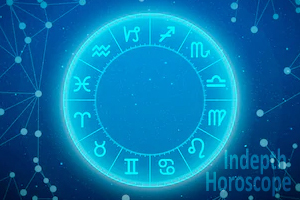 Mars will cast its aspect on the 4th house of your horoscope, so you should take care of your mother's health and make conscious efforts to avoid any dispute in the family. You might have some differences with a friend. This is a very favourable period for buying a property but be careful and don't finalize a property in a hurry as it can bring some problems later if purchased without due diligence. Mars will also aspect the 7th house of your horoscope and will enhance marital bliss in your married life. Here, Mars will provide you success in business as well. This is a great time to solve any differences with your business partner. Mars will aspect the 8th house of your horoscope as well and will make you research oriented in your approach. Any ailment that has been bothering you will be gone and this period signifies a long distance travel, especially 'sea travel'. If you want to settle in a foreign land, then this is a fantastic time for you. Mars will transit in the 12th house of your horoscope. Here, Mars will form "Vipreet Rajyog" and you will get success but with a lot of struggle. Mars will aspect the 3rd house of your horoscope and this means that your tasks will be accomplished by courage and will likely involve high expenditures as well. Expenditures might be on property, legal issues and medical bills. Mars might dampen your relations with your younger siblings but make efforts to mend your relations with them and help them if they are in need. Mars will also cast an aspect on the 6th house of your horoscope and if are looking to take a loan, then this is a great period to get your loan sanctioned. But remember- Do not give loan to anyone as the loan given by you during this period will not be recovered. Mars will aspect the 7th house of your horoscope as well with its 8th aspect and those who are looking to marry will see some marriage proposals coming their way during this time. Married life will be pleasant for married couples during this time and business gains can be expected. If you want to start a new business, then this is a very auspicious period. Mars will transit in the 11th house of your horoscope. Mars will be positive for you on a majority basis but there will be certain problems as well. You are currently in the period of 'Shani Dhaiyya' hence first of all you should worship Lord Hanuman. Offer red flowers to Lord Hanuman by visiting a Hanuman Temple on Tuesdays. Having said that overall Mars will bring very good times for you as it is transiting in the house of gains during this period. You will get benefits from elders but be careful of your ancestral property. Mars might promote gain from foreign lands during this time and will enhance the prospects of education. It will also be good for children and for couples who aspire to have a child, this period signifies a successful pregnancy but pregnant women should take special care of themselves. You should worship Goddess Durga to get rid of the minor negative effects that are slated to appear during this time. Recite Devi Sookta at least one time on Tuesdays. Mars will transit in the 10th house of your horoscope. Here also it will form "Ruchak Rajyog". You must not take any decision in a hurry or by blindly trusting anyone or by getting emotional. This is a very good time for you if you are in government service and you must make the best use of this time to sweeten your relations with high ranking officers. You should also improve your relations with your father during this time. Mars will improve your relations with your mother and will give you comforts of vehicle and home. There will be a joyful atmosphere in your home. This period is especially good for students. Mars will transit in the 9th house of your horoscope. This will be a great period for you as Mars will bring fortune in your life. There might be some expenditures during this time but make sure that the expenditures are on noble causes. Mars will bring an increase in your courage and your younger siblings and neighbours will be helpful to you. This is a very good period to buy a vehicle or property. Mars will transit in the 8th house of your horoscope. Mars will form "Vipreet Rajyog" but this period might bring injuries if you become careless as Mars in the 8th house inflicts accidents & injuries if one does not exercise caution. Mars will aspect the house of gains so money will come but you have do struggle for it. If you are facing some dispute regarding your ancestral property, then it will get resolved in your favour. Also any dispute in the family is likely to get settled in your favour. Your speech will favour you. The only issue would be obstructions in the inflow of gains but eventually through struggle it will all turn in your favour. Visit any Hanuman Temple and offer a garland made up of Tulsi to Lord Hanuman. Mars will transit in the 7th house of your horoscope. Here it will form "Ruchak Rajyog" and you will find a relief from all marital problems. Mars will aspect your 'Lagna' and it will strengthen your personality. It will also aspect the house of wealth and this will prove to be a very good period to accumulate wealth. However, be extremely careful at your work place and avoid generating difference of opinions with higher authorities and keep your distance from them. You might be transferred for some assignment in your job. Take care of your father's health. Mars will transit in the 6th house of your horoscope. 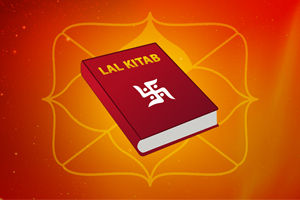 It will enhance your 'Lagna' and will strengthen all aspects of your personality. Mars will give you relief from a past ailment and a loan as well. In fact if you are looking to apply for a loan, then this is a good time to do so. You will emerge victorious over your enemies. Mars will enhance your fortune and will prove to be positive for your father. There might be small travels and be careful in them, however nothing to worry as the result of these travels will be beneficial. There will be expenditures and may be on leisure activities but stay away from bad habbits such as consumption of alcohol as this will bring serious problems to you. Do not take any decision in a hurry. You are undergoing 'Sade Sati' so worship Lord Hanuman. Mars will transit in the 5th house of your horoscope. This will be a great period for you especially if you are a student. Your name & fame will increase. This period signifies gain of child for those couple who are aspiring to become parents. You might face minor health issues during this period. You will gain through your knowledge however there might be some expenditures but those expenditures will be for your own good. People who want to visit abroad or even settle abroad will find this period particularly beneficial. Mars will transit in the 4th house of your horoscope. It will form "Ruchak Rajyog" and if you are likely to experience multiple gains during this period. This time favours gain of vehicle and property. You will have very pleasant relations with your mother and there might be an environment of party or celebration in your house. 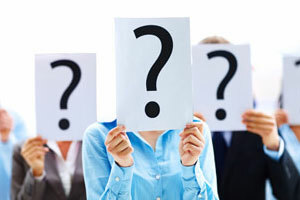 However there might be some difference of opinions with your spouse or business partner. This period is very beneficial for people doing a job. There will be growth in your business but keep in mind that you must not do anything motivated by unnecessary doubt. Mars will transit in the 3rd house of your horoscope. It will bring pleasantness in your relations with younger siblings. You will find an increase in your courage and this will help you in accomplishing your pending tasks. If you have taken a loan from someone, then you might get tense about repaying that but maintain your mental peace and everything will work out slowly. You will get assistance from luck. There might be travels and those travels will be fruitful. This time will be good for profession, both job and business. This is a great time for students who are preparing for a competition and also for students who are pursuing higher education. Mars will transit in the 2nd house of your horoscope. There period will bring wealth and your speech will influence others in your favour. There might be some problem on the child front so take special care of your children especially the health of young children. Students will find it hard to concentrate in their studies during this time. Be careful while driving as Mars will be aspecting the 8th house of your horoscope. Mars will invoke your common sense and will promote advancement on the spiritual path. You may also go on a pilgrimage. You will get support from fortune. Take care of your eyes. So this is what the in-general effects of Mars transit in Aries will be for people of all 12 Moon Signs. 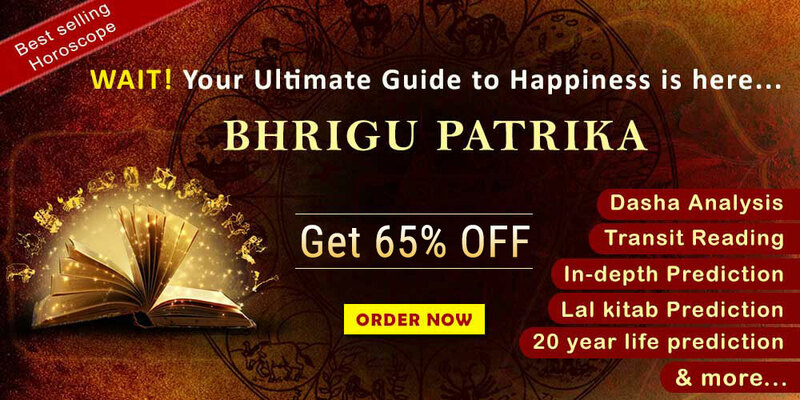 However, every person has so many other planetary permutations & combinations in his/her personal horoscope which must be taken into account before drawing a complete conclusion and arriving at remedial measures that would provide relief from all problems in life. How to Keep the Spark of Love Alive In a Love Marriage?